Muskegon, MICH. – In four previous meetings, Detroit Martin Luther King had never beaten Muskegon. The Big Reds pushed their record to 5-0 all-time against King Friday night, 24-21, in an instant classic. 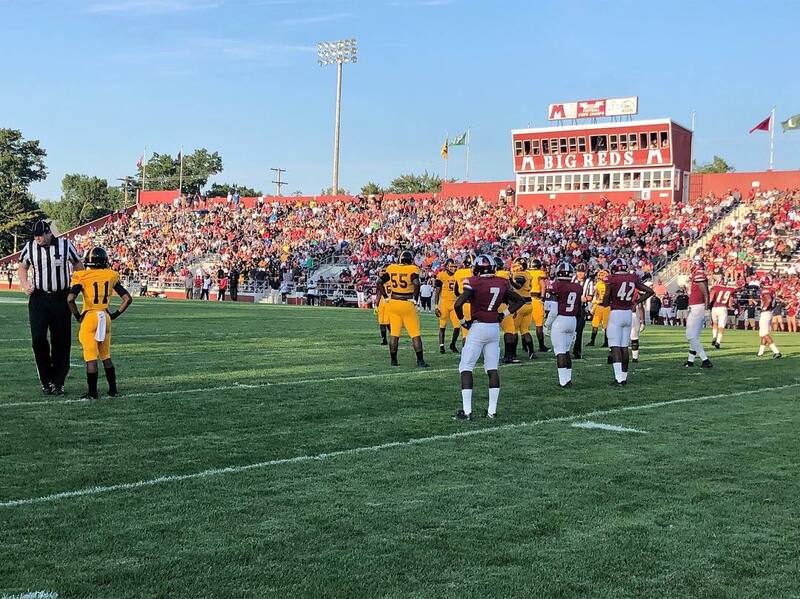 King was driving to take the lead on the final drive with under 35 seconds to go, when senior quarterback Dequan Finn (Central Michigan) mishandled the snap, which was recovered by Muskegon’s Billie Roberts. Muskegon (2-0) junior quarterback Cam Martinez scored his second touchdown of the game with 1:22 left in the game to give Muskegon the lead. Finn had just scored on a 2-yard run to give King a 21-17 lead with 5:03 left in the game, giving Muskegon plenty of time on the clock. Muskegon’s punishing run game was the difference in the game and on the final drive. Martinez did not have over five pass attempts and did not attempt on the final drive. King (1-1) had an opportunity to go up 21-17 late in the third quarter, but a dropped pass in the end zone on 4th down prevented that from happening. King also had multiple penalties and turnovers that contributed to the lost. Finn fumbled on the game’s first and last possession and threw an interception. Finn had a monster game last week and followed that up in week two going 17-30 for 271 yards and one touchdown, while rushing for 123 yards on 15 carries and two touchdowns. He almost led his team on a game-winning drive in a hostile environment at Hackley Stadium but could not handle the final snap of the game from his center, who was replacing King’s starting center who went out with an injury. King faces Pershing at home next week and will use it as an opportunity to get over the heartbreak against Muskegon.